Hole Editions > Artists > Iris Priest > Untitled (Stage 1), Published by the artist. 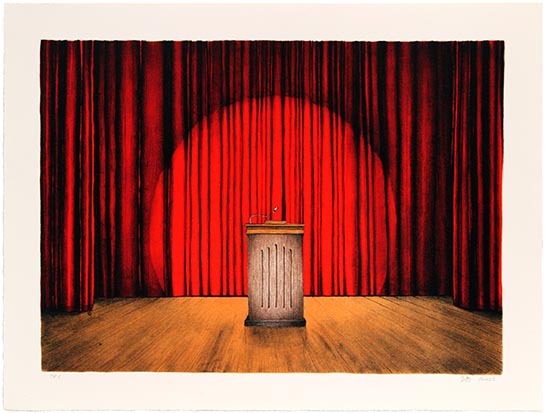 image size 10 5/8" x 14 5/8"
The scene: An empty political stage, a single spotlight illuminates the podium. Untitled (Stage 1) is caught in a perpetual state of anticipation, of waiting for the speaker to arrive. Foreshadowing the central protagonist and their animating voice - which will bring meaning, direction, or announce the latest political development - Untitled (Stage 1) platforms the space itself as subject and signifier. Stripped bare by false news and deceitful rhetoric, democracy has been reduced to empty electoral ritual, a theatrical struggle between two self-similar parties whose main aims are those of power and control rather than representation of the people. The political stage, like the theatrical stage, is a construction. From the red velvet curtains to the polished floorboards and solitary podium, every prop in this scene is deliberate, calculated and ideological. The political stage provides the backdrop and forum for the pantomime of modern imperial power. It is not empty but, on the contrary, teeming with projections, subterfuge and spectacle. As viewers, captivated by the eternal present of the media spotlight, our suspension of disbelief is total. Our attention directed to centre stage we do not see the invisible, behind-the-scenes machinations or question the reality and validity of the performance which will unfold before us.